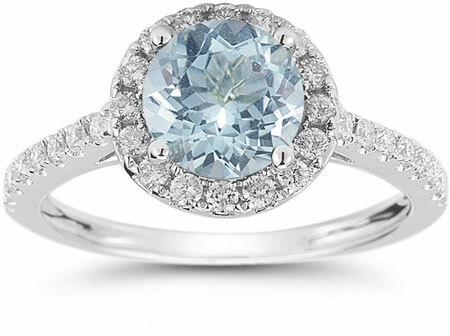 This Aquamarine and Diamond Halo Gemstone Ring in 14K White Gold combines cool color and simple sophistication. While this style isn't complicated, it's sure to take your look up a notch as it gives a time-honored design a fresh burst of life. The halo ring, a style that surrounds a center stone with smaller gems to magnify its brilliance, first came into vogue in the Art Deco Period, and it's enjoyed several revivals in popularity since the 1920s. However, while this style becomes slightly more or less trendy with the passing of time, it's always in good taste, and as this aquamarine and diamond take on the halo ring proves, it's a style with lasting, versatile sophistication. The 7mm round aquamarine that serves as the focal point of this ring has a refreshing sparkle that's been catching eyes for thousands of years. 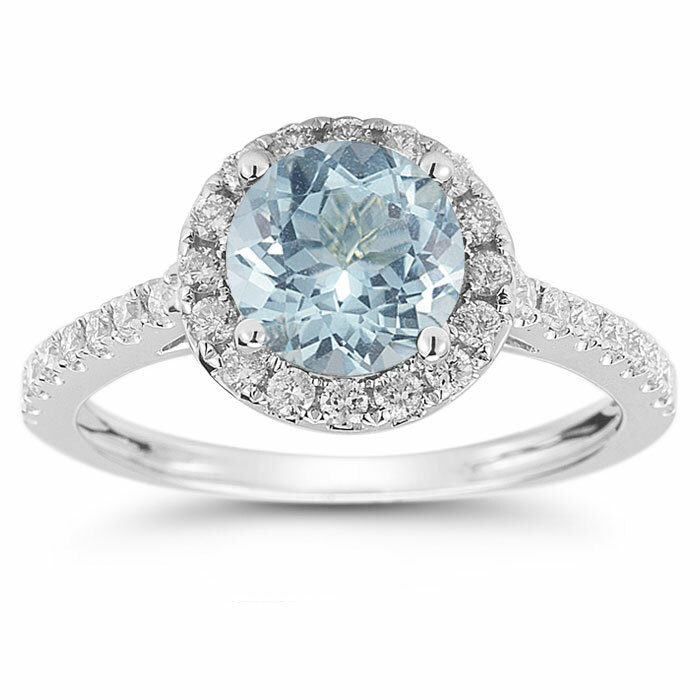 A total of 30 round diamonds accents the vibrant light blue gem that serves as the star in this lovely halo ring. Together, these colorless glittering stones weigh in at 0.40 carats, and they gorgeously complement the soft yet lively hue of the aquamarine, emphasizing its sparkle in a pairing that calls to mind the whitest, most sparkling sand against the clearest Caribbean waters. Wrapping around the aquamarine are 16 of these diamonds, while the remaining 14 stud the shining 14K white gold band. We guarantee our Aquamarine and Diamond Halo Gemstone Ring in 14K White Gold to be high quality, authentic jewelry, as described above.